New Qualcomm chipset to facilitate budget true wireless earbuds? | What Hi-Fi? The QCC3026 chipset could also inspire smartphone brands to bundle Bluetooth headphones. Following the CES 2018 launch of its flagship QCC5100 chipset (which promises to extend battery life and improve connectivity robustness), Qualcomm Technologies has now announced a new QCC3026 chip designed to help manufacturers create more cost-effective Bluetooth earbuds. The QCC3026 supposedly reduces power consumption by up to 50% compared to previous generation entry-level chips, and promises more sturdy wireless connectivity by simultaneously connecting a smartphone to both earbuds (so only relevant content is relayed). Qualcomm hopes its new chip will enable smartphone brands to improve their bundled buds offering, allowing them to include wireless pairs in the box in a world of increasing headphone-jack-less ‘phones. 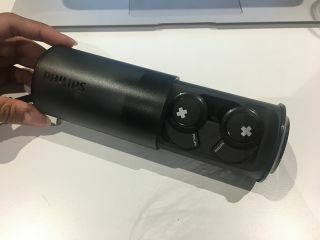 It could, of course, also vamp up the number of budget true wireless buds, which are rare (although not entirely unheard-of), with most pairs around the price of the £160 Apple AirPods or Sony WF-1000X. Oppo is the first to announce the first Qualcomm QCC3026-based wireless earbuds, which will be included in the box of some of its flagship Find X phones.